Spaghetti squash is a fairly large winter squash with a unique texture: when cooked, the flesh separates into strands, which is easily likened to spaghetti. Plenty of people like to put all kinds of sauces on spaghetti squash, as if the strand-like flesh were actual pasta, instead of just pasta-like in shape. I prefer roasted spaghetti squash relatively plain, with a bit of butter, salt, and pepper as it is here. In any case, I eschew the tomato sauce, which I don't find to be a particularly good match with this squash, and douse the strands in a creamy sauce or a spicy one. Note: Spaghetti squash are big. Most are at least 4 pounds, which will yield a solid 8 cups of cooked squash. Luckily, it freezes well after roasting, so just seal of extras and pop them in the freezer to use later! In the oven: Preheat an oven to 375°F. Poke the spaghetti squash all over with a fork. Set the squash in a roasting pan or just on a piece of foil and bake until tender (you should be able to pierce it easily with a fork — since you just poked it all over when it was raw, you should be able to feel a definite difference! ), at least an hour and up to 90 minutes (or even more if the squash is giant one). In the microwave: Similarly poke the spaghetti squash all over with a fork, then microwave it on high for 5 minutes. Poke it a bit more to see how it's cooking, then microwave in 2-minute bursts until the squash is cooked and tender all the way through—like a total of 10 to 12 minutes. Cut off and discard the stem end, cut the squash in half lengthwise, and scoop out the seeds. Then use a fork to scrape the cooked spaghetti squash into strands. 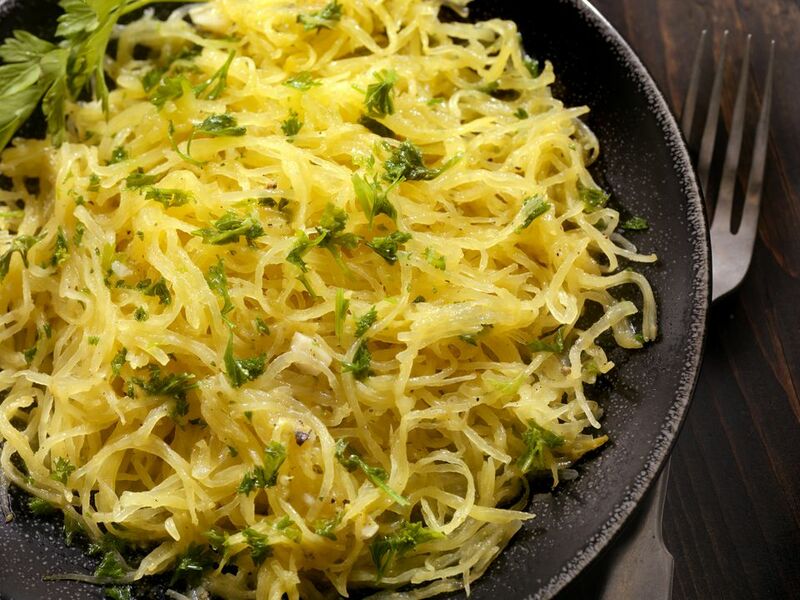 While still warm, top the cooked spaghetti squash with a pat of butter and sprinkle with salt and pepper. A bit of salty grated cheese, such as Parmesan, pecorino, or aged gouda is pretty tasty on there, too.